Esta descripción del trabajo de gabriel rivera rio zambrano fue preparada cuando gabriel rivera rio zambrano fue elegido como emprendedor social de Ashoka en 2016. Gabriel is introducing a new system for supporting microentrepreneurs by offering innovative asset-based microloans and creating a hub that connects them to equipment suppliers, peers, and potential clients while supplementing this with technical education and training. Gabriel´s financing options and network empower microentrepreneurs excluded from the system to increase their potential and profitability as independent and self-sufficient business owners. Gabriel provides integral support to microentrepreneurs who are excluded from access to financial resources. This enables them to start and expand their businesses which contribute to the construction of a robust and independent microenterprise sector in Mexico. By offering fair and innovative financial products and support, Gabriel serves the needs of small business entrepreneurs, 76% of whom are women. He does this by providing access to equipment and machinery, business and technical training, and a network of other entrepreneurs, providers, and buyers that help clients scale their operations successfully. Instead of merely offering credit and collecting payment, Gabriel´s model is involved in every step of the creation or expansion of a business: training, obtaining credit, marketing, and product sales. Traditionally, microfinance institutions do not give clients the necessary tools to start and grow their own businesses, making them dependent on limited providers and the sale of their products by third parties. Gabriel´s initiatives change the focus by creating strong alliances between providers, producers, and clients, increasing the value of their products and sales. Gabriel´s web-based, easy to access platform coupled with a human-centered model enables microentrepreneurs to gain access to affordable financing in several ways. These include discounted, high-quality machinery; a larger, reliable and higher quality supply chain; and wider markets. This enables them to create a sustainable lifestyle for themselves and their families. Business owners can expand their businesses in a sustainable way. They are able to improve their economic situation while learning hard skills and becoming empowered individuals at the same time. This can finally be done without the fear of debilitating over-indebtedness, most often caused by unmonitored, unrestricted traditional loans and extortionate interest rates. In Mexico, financing options for micro-business entrepreneurs are limited at best and extortionate at worst. Although the country has a large microfinance sector, the microcredit lenders can demand an interest rate of up to 200% (traditional) or 500% (online loans) in just four months, which demands that the client creates a business that has over 200% of utility in a very short period of time. Since they tend to use private funds, online financial institutions are not regulated by the authorities, and are free to charge any rate they choose. This situation, coupled with the difficulty that accessing bank credit proves, pushes people to commit to credits they cannot afford to pay. Traditional and online MFIs do not regulate or follow up with the clients to know if the credit was used for profit generation, which allows the clients to use the credit for nonbusiness expenses, or even for paying off previous debts. This creates a vicious circle of over-indebtedness and vulnerability. Microentrepreneurs often lack the business skills that could push them to become truly competitive. This includes the ability to connect to other actors that can add value to their businesses - from trainers to potential buyers. Financial institutions do not prioritize helping microentrepreneurs strengthen and scale their businesses. Nor do they provide opportunities for them to connect amongst themselves and others. Entrepreneurs often operate in isolated spheres. This disconnection has a negative effect on the competitiveness of their businesses. Only 20% of microenterprises in Mexico survive after their first 3 years of business. Various government programs have tried to tackle these issues by offering business training or commercialization of products. However, they have failed to involve the clients or beneficiaries as active parts of the value chain, and do not offer viable financial solutions. Microentrepreneurs become dependent on third parties for lack of alternative options and risk losing their clients due to external conditions, such as changes in the government. Small business owners, especially in industrialized areas of Northern Mexico, produce highly demanded products, but in isolation of markets and supply chains. This makes them vulnerable to unstable external circumstances, as well as the many institutions and individuals who take advantage of this isolation. Being an active observer of the deep economic disparity in his home state of Nuevo Leon, Mexico, Gabriel identified the need for technical capacity building and access to credit for small, struggling business owners. He began his skills training nonprofit - Altitud in 2009. It initially started supporting women in the textile industry by giving them technical support and loan credits to build their businesses from home. As Altitud grew, Gabriel saw the need to expand into other sectors and populations as well as change his mode of financing. In 2012, Altitud became a financial institution. The goal here was to grow the microenterprise sector into a strong and sustainable force in Northern Mexico. One of the first issues Gabriel saw was how unrestricted loans were not helping women grow their business. As a result, he decided to approach equipment providers and change his model to better accommodate the needs of his clients. Gabriel approached various sewing machine manufacturers and distributors. Through developed relationships and a clear understanding of business needs and motivations, he created alliances with a variety of providers. Altitud ensured and facilitated monthly payments to providers who wished to expand their sales, but were unwilling to sell their products to small business owners who could not pay the total amount upfront. This made providers even more eager to partner with Altitud. This enabled clients to pay in instalments for necessary products which they would not be able to obtain without the assistance of an external negotiator. The quantity of machinery sold to Gabriel’s clients enables Altitud to purchase this equipment at discounted prices. As the asset-credit program grew, Gabriel approached other providers. Today, he works with providers of not only textile-related machinery, but also refrigerators, food trucks, delivery vehicles and other income producing equipment. Apart from connecting clients with reliable providers, Altitud also directly receives requests from clients through their providers´ sales teams, thereby lowering operating costs and expanding their client base. The clients do not receive credit in cash. Instead, they receive assets through this network of local suppliers who offer the necessary equipment for their businesses. The supply companies that form this network commit to offering technical support, guarantees on the products and to buy back any equipment if a client is unable to pay for the loan. This reduces the risk for clients with delinquency rates. The asset goes directly to the lender once the credit has been approved without any external money transactions. This transaction model also serves to verify that the loan has been used as directed, for investment in the business and not for personal expenses or external loan repayment. The clients pay their loans in banks or nation-wide convenience stores such as OXXOs, which have a widespread presence and are accessible to almost any person in the country. Altitud collects an average of 50% annual interest on microloans to maintain its operations, with the possibility of a maximum two-year payment plan for clients, and a deferment of payments for ill or injured clients. Having an integral approach to financial empowerment, Gabriel knows that simply providing credit access does not truly improve the situation of microentrepreneurs. From the beginning of his project, he has focused on providing courses and training through collaborations with international and national education institutes, as well as public and private sector partnerships. Altitud has partnered with institutions such as Cemex, CEMID, Beckmans School of Design and the Nuevo Leon State University, and public institutions such as DIF, the Institute for Women, and various municipalities. Through these workshops and training sessions, microentrepreneurs can improve their business models, techniques, and salary earning potential, as well as learn new crafts and skills. Even with the access to credit and skills training, without connections to other entrepreneurs and expanded markets, Gabriel understood that these business owners would not reach their entrepreneurial potential. 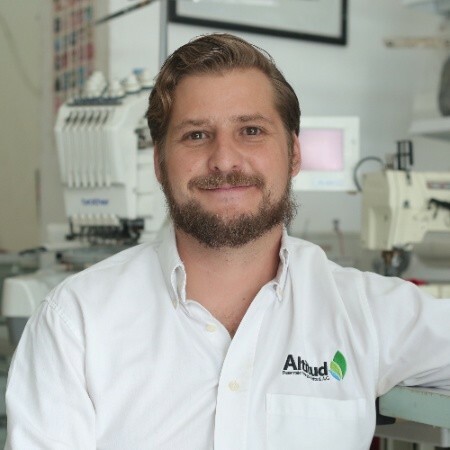 Gabriel has created international connections, generating commercial relationships between small business entrepreneurs in Mexico and businesses in other countries, principally in the United States, and mainly in the textile industry. Many of Altitud´s clients have been connected to buyers such a Katitizi - an American clothing company, who are now part of their supply chain. Others have teamed up to design a children´s clothing line and sell it to local wholesalers, dividing the manufacturing work. These successful projects are already being replicated in other sectors such as agriculture and artisanry. Altitud is legally set up as an SOFOM (a regulated Mexican financial institution). It currently has a team of 8 people and a yearly budget of 1 million MXN (about 58,000 USD) of operating costs and 5 million MXN (about 290,000 USD) of the credit portfolio. Since the start of its operations in 2012, Attitude has trained over 400 microentrepreneurs – 76% of which are women - given over 500 productive credits, helped create and sustain more than 200 businesses and over 2300 jobs. Gabriel´s clients have increased their income by an average of 30% after receiving Altitud´s services. Currently, Altitude has 130 active clients in the food and textile industries amongst several others. Gabriel foresees that by 2018 Altitud will triple its credit capacity, with a portfolio of 15 million MXN and almost 2000 clients. By 2020 the portfolio is expected to be 50 million MXN and 5000 clients. Gabriel spent his childhood in the state of Hidalgo, one of the poorest states in Mexico. This had a significant impact on his life as he lived close to poverty and witnessed profound economic inequality. His family was one of the thousands of victims of the 1994 financial crisis in Mexico, in which many people, including his father, were unable to pay millions of pesos in loans to financial institutions. When he left the state, he understood that he could not be indifferent to poverty and the realities of over-indebtedness. Gabriel studied agricultural engineering at the Texas A&M University and worked on ranches and farms. He learned about the countryside and understood that the rural sector can be developed through business models and not only through welfare schemes. He learned of different models of production and techniques that were not being used in Mexico. This made him want to come back and develop a model to eradicate poverty. After finishing his university degree, together with his friend from high school, Gabriel founded and worked together on La Procedencia - a food production company based on fair trade practices. Many years later, after seeing the wave of violence in the north of Mexico, he decided to start Altitud as a nonprofit that trained women of little means to develop their own businesses. This initiative evolved into the skills training, market-connecting, asset-based financial institution it is today. Gabriel is a strong believer in innovation and modernization as part of his organization. He always seeks to redefine, reinvent, and improve the Altitud model, never losing sight of his objective: Being part of the change in Mexico and the world. This is done by developing opportunities to empower entrepreneurs to bring themselves and their communities out of economic vulnerability and isolation into an expanded, inclusive network with real potential for economic growth and a decent quality of life.